Some firms are trying new approaches to put big ideas to use. What's working? All innovation begins with an idea. Whether it be a small tweak to an existing product or an entirely new business model, innovation and change requires new ways of looking at problems and thinking about solutions. However, ideas don't often appear as a flash of lightning and "aha" moments are difficult to plan for, especially when faced with the day-to-day challenges of running an organization in today's legal market. Or any market, for that matter. Nexlaw believes that innovation can occur by design. It can be structured, measured and harnessed to create value for businesses and their clients. We've worked with organizations to put innovation into practice through smaller projects focused on redesigning individual client relationships or practice team offerings, up to broader innovation programs designed to capture and reward ideas, rapidly evaluate them against key criteria, and to test them via real-world client and market feedback at scale. We borrow from the startup playbook and utilize lean methodologies to quickly build, test and learn to de-risk investment of time and money into new projects without slowing the pipeline of new ideas. And in an increasingly competitive market, a healthy pipeline of new ideas and the ability to put them to use is crucial to success – or survival. Innovation can be defined as a process, with clear steps and checkpoints that allow for rapid validation and go/no-go decision making when testing and evaluating ideas for new products, services or approaches. The innovation process - or more precisely, the ideation process - often begins with a specific question, problem or hypothesis: "We can reduce cost single-plaintiff litigation matters by rethinking our client onboarding and service delivery processes", or "we are being priced out on patent prosecution work in the US due to boutiques and alternative providers". One way Nexlaw has helped clients approach this process is by taking an interactive workshop approach; a facilitated session with a small, cross-functional team focused on identifying client or team challenges and opportunities, and developing/validating ideas in a way that can easily be communicated to and evaluated by decision makers. Most worthwhile ideas require more than creating or installing some new software, or implementing a new process or project approach. Firms need to consider the broader impact of introducing a new product, service or system; in other words, the entire business model should be understood before investing or worse yet, exposing new ideas to clients or new markets. 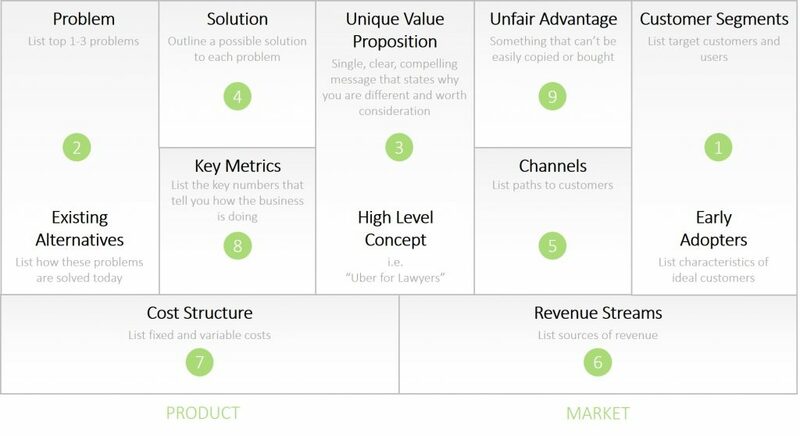 Again borrowing from the startup ecosystem, Nexlaw utilizes approaches and tools such as the lean business model canvas to help guide and document high-level and strategic questions and answers about new ideas without getting bogged down in management consulting-speak.